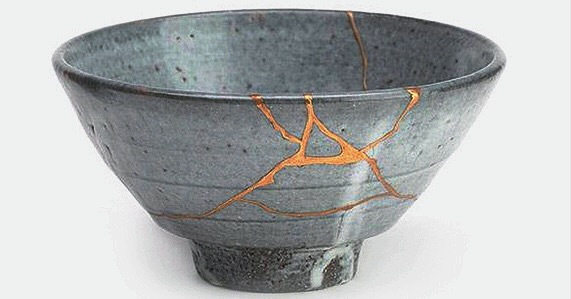 Kintsukuroi or Kintsugi as it is often called is a Japanese art of repairing broken pottery with gold and often silver to transform a broken pot or dish into something more beautiful than it was before it was broken. Although it is simply a repair of a broken piece it is considered more than that. It is a way of adding value and beauty enhancing the life of the piece, celebrating the flaws and the result of healing of those flaws. A rebirth if you will or at least a proud flaunting of the fault and is a way of turning ugliness into beauty, a celebration of the history of the ceramic piece as expressed in the repair rather than throwing it away. Kintsukuroi is thought to have its roots in the 15th century but may have actually been employed earlier. Kintsugi is thought to have originated when a damaged teapot was sent back to China for repairs and was returned with staples holding the pieces together. this caused the Japanese craftsmen of that time to consider a combination of Maki-e (application of a Japanese lacquer sprinkled with gold or silver powder) in order to provide a more pleasing repair job. This art form became so developed and popular with collectors that it has been suggested some pottery has been deliberately broken just so it can be repaired with gold, much like todays jeans are often made and then holes ripped in them prior to seeling as a fashion item. This art is now not simply relegated to Japan and one can find it in employed in China, Vietnam and Korea also. Crack. Where the use of gold dust and resin or lacquer are used to attach the broken pieces. The gold dust is mixed in with the lacquer and applied very delicately to the edges of the broken pottery before joining them ensuring there is no overlap. Piece Method. The Piece Method is where a compound of resin or lacquer with the gold or silver dust is used to replace a missing piece of the object. Joint Call is similar to the piece method except that a non-matching fragment is used to replace the missing piece. This creates a patchwork effect and it is almost an art form in itself selecting the right piece to blend in with the rest of the piece. Practicing Kintsugi requires some practice and developed skill. There are various lacquers one can use but the most authentic requires the use of Urushi, a Japanese lacquer. However it is a poison so careful handling is required. Gloves are suggested as it can give one a very nasty rash that is heard to remove. Alternatively one can simply add 24 karat flakes to the glue before applying it. One can also rub gold flakes over semi dry urushi but this will eventually wear off. There are kits available online that have all the materials and even include the gold powder. They range from around 500 dollars and up.